Twin Peaks is widely regarded as a missed opportunity. 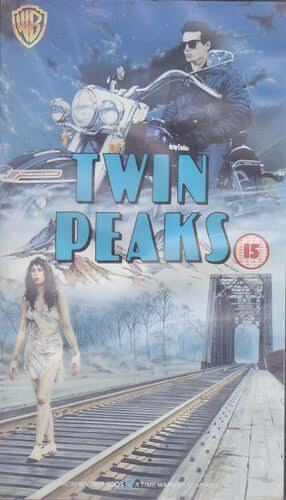 Made by David Lynch as the pilot for a planned TV series, it was salvaged into a film by adding an ending sequence. The film’s roots in television are obvious, introducing a sprawling cast of characters – some of whom don’t even get lines of dialogue, such as the mysterious Log Lady. If an ongoing series had been made, it would have been delightful to learn more about these characters, but sadly we had to wait a few years until Mulholland Drive to get a proper taste of Lynchian television. As it is, the film is often seen as a failure. The ending sequence does appear disconnected from the extensive busywork beforehand – after introducing character after character, each with their own problems and conflicts and each a potential suspect in the central murder mystery, the film abruptly reveals the murderer to be someone we haven’t even seen before, who is hiding out in the basement of the hospital. The murderer’s partner/foil shoots him, then apparently dies of a heart attack, and that’s it, except for a strange and dreamlike coda in a red-curtained room that is widely regarded as inexplicable. However, I think Lynch has given us all the clues we need to make sense of this film. Let’s take a look. We get more evidence that the townsfolks’ secrets are the cause of the murder when we meet Mike and Bob at the end of the film. They seem ordinary enough on the surface, but these two men are clearly meant to be interpreted as strange, magical beings from somewhere else (there are two worlds, as the magician’s chant reveals). If Bob could hide in Laura’s room while her mother looked for her, he is clearly using some otherworldly nature to do so. Mike tells the story of how they lived among the people, above a convenience store no less. The film seems to be telling us that Mike and Bob are drawn to people like the ones we have been watching for the previous ninety minutes – deeply flawed and full of secrets. Or, to flip it into the kind of magical logic suggested by the killer’s use of rituals and magic chants, the town’s many secrets bring down dark spirits upon their head, with Laura Palmer, the homecoming queen/drug user/friend-of-prostitutes-and-murderers, as the incarnation of the town’s dual nature and the prime target for sacrifice. While Mike has reformed from his murderous ways, Bob promises to kill again, provoking Mike to murder him. The case seems to be resolved, but it is clear Cooper is unsatisfied. As candles blow out, Cooper makes a wish – and we immediately cut to 25 years later. The meaning of this cut seems clear: his wish was to understand the strange logic of what he witnessed in Twin Peaks. He has spent his career on this quest, and finally, as a much older man, he has found his way to the somewhere else. There, he meets a spirit wearing the form of Laura Palmer. (Bob claimed to catch people in his “death bag”, which presumably means he steals the form of his victims and carries it back to the second world.) The spirit, we are told, is full of secrets. She whispers into Cooper’s ear the answers he was seeking. Credits roll. I don’t make any grand claims that this film approaches the thematic coherence of later works like Lost Highway, but I think it holds together a lot more thoroughly than most give it credit for. Indeed, from my perspective there is only one piece of the film that remains with me as both unexplained and deeply disturbing. 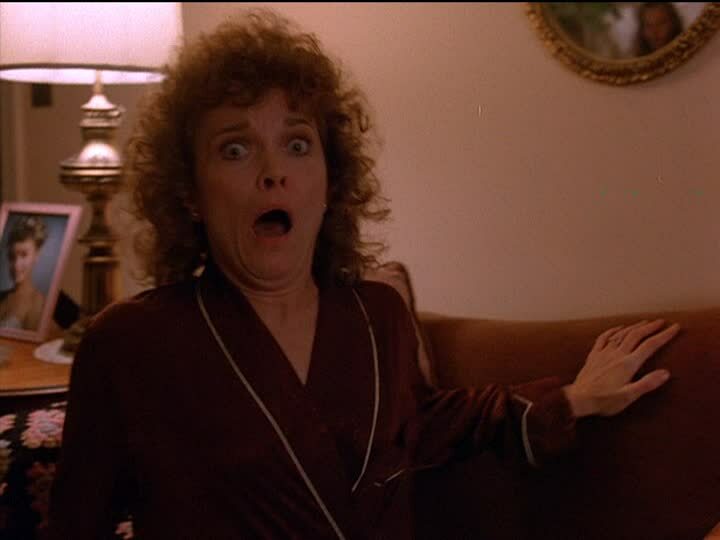 The final sequence of the film begins with Laura’s mother remembering that she had in fact glimpsed Bob in Laura’s room that morning. As she screams in terror and calls for help from Laura’s father, we can see over her shoulder a mirror on the wall. And, blurry but definitely visible in my Blu-Ray copy of the film, we can see a face in the mirror – and it is unmistakably that of Bob himself. He is apparently right there in the room watching as Laura’s mother loses her wits! Creepy as hell. In any case, this film is recommended, and not just so we can imagine what a Twin Peaks TV series might have been like. Instead, let’s appreciate it for what it is – a satisfying and complete film in itself. Posted by morgue on Sunday, November 13, 2016, at 12:21 am. Filed under mediawatch. Tagged Twin Peaks. Follow any responses to this post with its comments RSS feed. You can post a comment or trackback from your blog. That video cover is amazing! Who’s the dreamboat riding his motorcycle through the sky? Is that Agent Cooper? I’ll bet he would have been the fan favourite if this had made it to series.